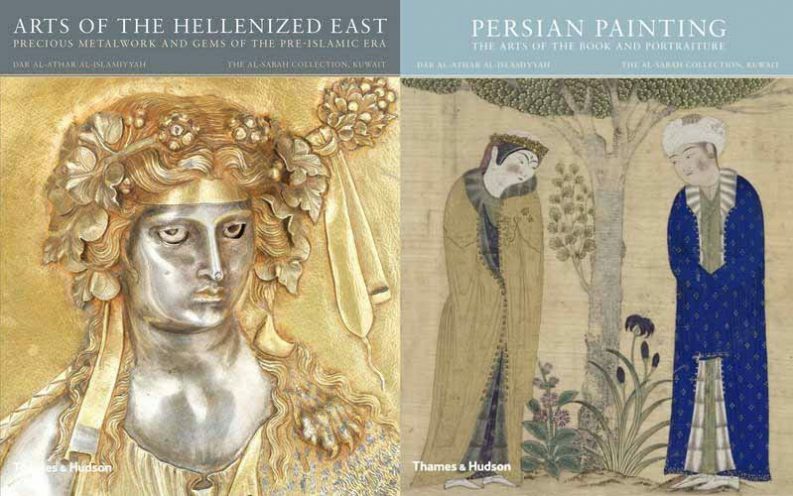 Arts of the Hellenized East: precious metalwork and gems of the pre-Islamic era / Martha L. Carter ; with contributions by Prudence O. Harper and Pieter Meyers. London: Thames & Hudson, 2015. The al-Sabah Collection, Kuwait. This is the sixth volume in Thames & Hudson’s series exploring the treasures of The al-Sabah Collection, Kuwait. The al-Sabah Collection houses one of the world’s most spectacular collections of ancient silver vessels and other objects made of precious metals and gems, dating from the centuries following Alexander then Great’s conquest of Iran and Bactria in the later 4th century BCE up to the advent of the Islamic era. Leading expert Martha Carter discusses eighty spectacular bowls, drinking vessels and other luxury items from the Hellenistic East, including many rare and important objects never before reproduced in print. The decorative motifs of these objects…testify both to the astonishing skill of their craftsmen and to the complex interconnected cultural histories of Greece, Iran and Central Asia. These connections are explored further in two illustrated essays. Prudence O. Harper’s discussion of a group of Sasanian and later Central Asian works of art and an essay by Pieter Meyers on the technology of ancient silver production. Martha L. Carter holds a doctorate from Case Western Reserve University and has taught and curated at institutions including the Cleveland Museum of Art and the University of Wisconsin. She has published extensively on the art and archaeology of India, Iran, and Central Asia. Prudence O. Harper is Curator Emerita in the Department of Ancient Near Eastern Art at the Metropolitan Museum of Art. Pieter Meyers is an independent scholar and Senior Research Chemist at the Los Angeles County Museum of Art, where he was formerly Head of Conservation – publisher. Persian Painting: the arts of the book and portraiture / Adel T. Adamova and Manijeh Bayani. London: Thames & Hudson, 2015. The al-Sabah Collection, Kuwait. Persian miniature painting is among the most well-established and celebrated traditions of Islamic art. Written by two eminent scholars specializing in Persian painting and epigraphy, respectively, Persian Painting catalogs more than forty masterpieces of Persian miniature painting, manuscript illustration, and bookbinding in The al-Sabah Collection, Kuwait. Co-authors Adel T. Adamova and Manijeh Bayani place the works in an artistic and historical context and demonstrate their significance in the development of Persian painting. From a historical perspective, they document the movement of manuscripts through their owners’ seal impressions and librarians’ notes, and identify various works by scribes and illustrators involved in the production of these manuscripts and miniatures. Richly illustrated and including rare examples from the pre-Mongol invasion period never before reproduced in print, the book (the seventh in Thames & Hudson’s series exploring treasures from the al-Sabah Collection) also includes illustrated folios detached from important fourteenth- and fifteenth-century manuscripts and paintings from dispersed Safavid and post-Safavid albums, as well as seventeenth-century bookbindings and oil paintings from the Zand and Qajar periods. Adel T. Adamova is a curator at the State Hermitage Museum, St. Petersburg, and a prominent author of numerous books and articles on Persian painting. Manijeh Bayani is a specialist in Persian epigraphy and has contributed to numerous publications and articles on Persian manuscripts and inscriptions. – publisher. The Silk Road is the journal of The Silkroad Foundation, published annually and supplied to academic libraries free of charge. There is also a free online version of the journal available. 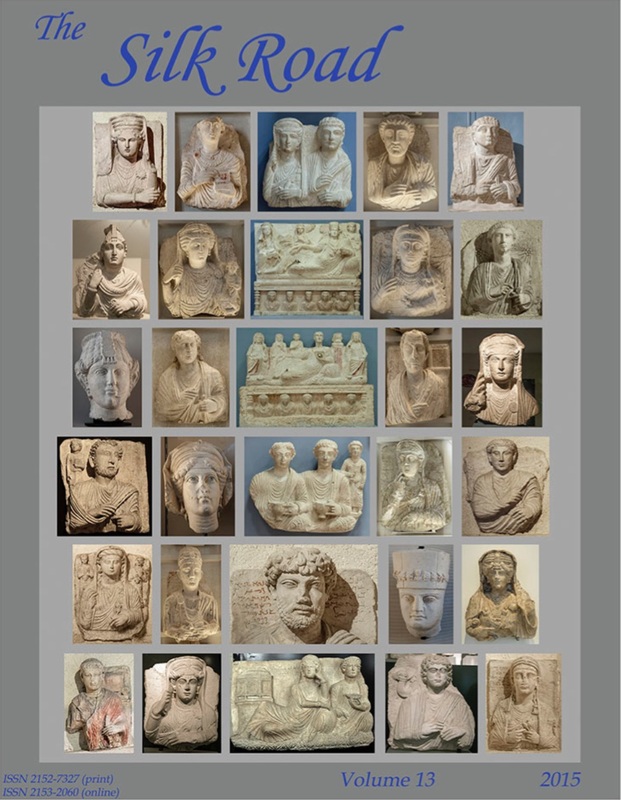 Volume 13 of The Silk Road includes a selection of images of Palmyra, a tribute to the memory of Khaled Mohamad al-Asaad, Syrian archaeologist and Head of Antiquities for the ancient city of Palmyra. Khaled al-Assad ‘…devoted much of his life to studying and protecting the antiquities of Palmyra, the World Heritage site in Syria which UNESCO cited as “a great city that was one of the most important cultural centres of the ancient world.” Al-Asaad’s dedication and what it symbolized cost him his life, when Daesh publicly beheaded him on 18 August of this year.’—In Memoriam, page v, The Silk Road.